Samsung Series 3 305E Review: A competitively priced 17.3" screen Samsung laptop, offering 6GB RAM, 750GB Hard drive, an AMD A6 3420M 1.5Ghz processor, all running on the reliable Windows 7 Home Premium 64-Bit - the Series 3 305E offers exceptional value for a 17.3" screen laptop. With a well thought out design, if you're looking for a larger screen laptop on a budget, then you can do a lot worse than the Series 3 305E - Read on for our review of this entry level notebook. Below is our review of the Samsung Series 3 305E, a 17.3" laptop, featuring 6GB RAM, 750GB hard drive and Windows 7 Home Premium 64-Bit. 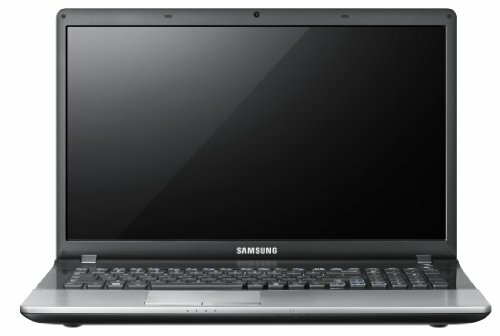 The Series 3 305E is Samsung's entry level 17.3" laptop, and is competitively priced at around the £400.00 mark. There are both advantages and disadvantages of having a larger screen over the usual 15.6" display found in most lower end laptops. The increase in screen size makes watching media, playing games, working and pretty much any other use, a more comfortable experience - both the screen, as well as the keyboard, will be larger and so overall the notebook will feel less cramped and more user friendly. This is a definite advantage, especially if your laptop is intended to be your main computer, rather than your secondary or tertiary method of personal computing. However, this increase in screen size comes at a price - typically a laptop with a larger screen will cost slightly more than it's 15.6" screen equivalent - it will also have larger dimensions, as well as weigh more - two factors which if you regularly commute or plan on travelling, may make this laptop less suitable for you. Finally, a larger screen will result in more power being used, and thus built in battery will power the laptop for less time. The first thing you notice about the Series 3 305E is the striking design - it appears slim, and features a beautiful anti-fingerprint finish - this should help it maintain it's finish and stop it from looking untidy. Despite being essentially an entry level laptop, thought has still gone into Series 3 305E's design - with clean lines and a decidedly designer minimalist feel to it. The low weight is an added bonus - around 2.5kg on our scales - yet despite this, it has a solid feel to it, in terms of the laptop body itself, the keys and the palm rests - so this may be a suitable for those with inquisitive children and pets. The display feels well built, with strong hinges, and the lid feels like it can put up with the regular wear and tear that laptops inevitably go through. In fact the only slightly weak aspect of the laptop was the DVD drive, which felt a touch flexible - however this wouldn't put us off this laptop, simply as the percentage of time that this will be open will be pretty insignificant. Onto the display - as mentioned this is a 17.3" screen - this appears fairly crisp - maybe not as good as laptops costing twice it's price, but still pretty good for the money. It is surrounded by a thin black bezel, thus keeping the overall dimensions of this laptop as small as possible. The matt finish to the display is an added bonus - this heavily reduces reflections, thus making working in daylight and other brightly lit environments comfortable, with no eye strain or distractions. The brightness and contrast levels are fairly adjustable, so you can easily find the optimum setting for your eyes and environment. The inbuilt speakers aren't bad by laptop standards - however for audio buffs, as with most laptops, may want to invest in a decent set of headphones or external speakers. Typical of Samsung's new Series range is the spaces between letters on the keyboard - this isolation between the keys feels comfortable to type on, as well as making the laptop easy to clean. This spacing also aids people with visual impairment, as well as those with less control over their hands, making typos due to accidently pressing adjacent keys less likely. Each key has a gentle action, with a reassuring action. Accountants, number crunchers and other users who require regular numerical input will love this notebook - with a full sized number keypad located to the right hand side of the keyboard. A generous size touchpad completes the controls - as with most of the Samsung range it feels smooth, responsive and accurate - the multi touch control may take a little getting used to for people who are used to older style laptops, but you soon pick up the knack, and it certainly improves the overall browsing experience. Storage wise the 305E offers a solid 750GB hard drive, which should be more than ample for your software, files, music and photos. It also features a generous 6GB worth of RAM, to keep everything running fast Processing duties are handled by the competent AMD A6 3420M processor running at 1.5GHz - in our experience this is pretty quick for regular browsing, processing documents and sending e-mails, but for processor intensive tasks such as gaming and HD video editing, you may want to spend a little extra for a slightly faster machine. The graphics card is also manufactured by AMD; the Radeon HD 6470M model is included, which performed very well considering the relatively low price of this laptop. For average household use, this laptop will be more than adequate though, with the added bonus of it running pretty quietly, and stays fairly cool. Connectivity wise you get 3 USB slots, 1 HDMI port, 1 x Ethernet, VGA, separate microphone and headphones jacks - more than enough for most users. Battery life is fairly standard - the larger 17.3" screen obviously drains more power than a standard 15.6" model - so this model will require regular recharging if you plan on using the notebook out and about, or whilst travelling. Samsung have included their BatteryLife Plus technology – which helps provides Anti-aging battery performance - according to Samsung, this helps the battery keep 80% of its original capacity for anywhere up to one thousand charges. Operating system is the reliable Windows 7 Edition Home Premium - this is fairly standard amongst laptops, and is perfectly functional. Pros: Decent screen, looks great, and performs well with an impressive 6GB Ram and 750GB hard drive. A lot of laptop for your money. Cons: Battery life isn't amazing. To sum up, this Samsung laptop is ideal for a family, for students and for those looking a cheap 17.3" display laptop - it's well built, features a large screen, fairly fast, lots of storage and perfectly functional for day to day use. The stylish design has the look and feel of laptops costing considerably more than the relatively low price tag of the Samsung Series 3 305E.